It’s fairly easy to get started with iCloud if you use a single Apple ID solely on your own devices. But many families—including mine—share a single Apple ID across multiple people and devices, so that they can purchase apps and music once and give everybody in the family access. Must you all share that same Apple ID for iCloud, too? No, you mustn’t, and you probably shouldn’t either. Just because my wife and I both want to own Hanging With Friends, that doesn't mean that we want to share the same contacts, inbox, or bookmarks. Using our existing Apple ID for iCloud would lead to just such unintended, undesired sharing. And sharing iCloud accounts would also mean that we have to share our backup space; we get 5GB of free iCloud storage from Apple, but merely updating my iPad and iPhone gobbled up more than 3 of those gigabytes. If my wife wanted to back up her iPad and iPhone to the same iCloud account as me, we’d be up iCloud creek without a parachute—by which I mean, we’d quickly run out of free space. The good news is that you can continue to share an Apple ID for iTunes purchases with your family while maintaining individual, separate iCloud accounts. And the even better news is that Apple totally approves of your doing so, so you needn’t feel guilty about it. Either from your Lion Mac or your iOS 5 device, enter iCloud’s settings. On the Mac, look in System Preferences; on the iOS device, launch Settings. By default, iCloud on your iOS device may assume you want to use your standard Apple ID—the one you use when purchasing apps—for iCloud, but you’re not required to do so. Side note: Were you so eager that you already configured iCloud using your standard, app-buying Apple ID? Fret not. You can click Sign Out on your Mac to get out of that account, though you’ll need to click through a few friendly dialog boxes first. (Your Mac will confirm that by signing out you’ll lose access to Documents in the Cloud, Contacts, and the like, and ask if you want to keep or remove from this Mac such iCloud-stored data. Don’t worry too much; your data is safely in iCloud if all else fails.) On your iPhone or iPad, you can remove your now-unwanted iCloud account from the bottom of the iCloud section of Settings. Tap into your iCloud account there, scroll to the bottom, and tap Delete Account. 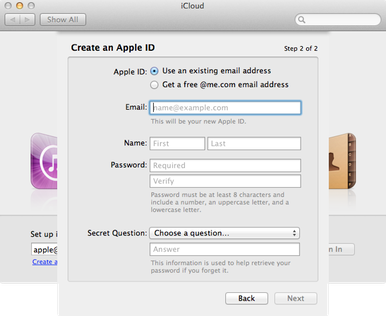 Now, whether on the Mac or the iOS device, just follow Apple’s steps for setting up iCloud. You can use an existing email address of your own, or create a new, free me.com account. Once you’ve created your new account, you’ll want to log into that same iCloud account on all your other devices. Other folks in your family should repeat the process for themselves, with their own email addresses. Sadly, this solution won’t work quite as well for you if you use different iOS devices but share a Mac. Although you can configure multiple iCloud email, calendar, and contacts accounts on an individual Mac, only one iCloud account per Mac can sync documents, bookmarks, photos, and the like. Bonus iMessage tip: If the folks you share an Apple ID with will all use iMessage, it’s a good idea to use your new, unique iCloud accounts for iMessage, too. By default, iMessage will try to use your main Apple ID, and sharing that ID across multiple iMessagers will only lead to trouble. To change your iMessage address to a unique email address that only you use, go into Settings and choose Messages. Next, tap Receive At, and then tap on the Apple ID at the top of the screen. In the pop-up dialog that appears, choose Sign Out, and then sign into your unique account instead.